Recently I was asked to speak at a community lecture series in a subject area I rate highly as a general interest, but am not really an expert in. The series was being curated in response to another community-based lecture series that quite explicitly erased women thinkers and philosophers from its curriculum. I was being asked, as a feminist enthusiast, to contribute to a politically-corrective community event that was taking women intellectuals seriously. I felt ambivalent about being asked to do this. Being a novice in the field, part of me felt that giving a lecture on feminist philosophy would give ammunition to the male philosophers who believed that there are no women in philosophy because women are too frivolous to take it seriously. I felt a responsibility to all women, all three billion of them, to only speak with authority about the things I knew that I knew. And to leave the difficult stuff to the experts. When you find yourself underrepresented in a world, as women are in public life, you feel the gravity of being called upon to speak on behalf of your type, your species, when you speak publicly. And you find yourself being used, however discretely, as evidence of something resulting from your type. The fear of mediocrity is powerful. If you, as a representative of X type, do a crappy job of something, doesn’t that prove that you’ve used the politics of representation to advance your own interest, your career or something, rather than contributed meaningfully to public discourse? Fear of mediocrity is exaggerated in the mind of a person being called upon to speak publicly who fears speaking publicly. But it also discounts the fact that most of everything is mediocre, and in public life, that means most men are mediocre, too. I have a friend who tells me she loves seeing what she terms ‘mediocre women’ at the top of their fields, especially in public, because it shows that feminism is working: some women have made a success of themselves as men have always done, through acquiring privilege and seizing opportunities with a sense of entitlement, rather than by the myths of brilliance and sacrifice. Working in magazines, I know a lot of magazine editors, and there’s an anecdote that is widely corroborated in the field: when you pitch a difficult commission at a woman writer, she’ll usually say she is not an expert, or that she doesn’t have enough time. When you pitch it at a male writer on the other hand, he’ll usually take it up, and sort out the pragmatics later. This is not a criticism of male writers – for any person, writing in public is emotionally and intellectually difficult, and most people find conjuring the confidence almost impossible. It requires a sturdy ego to write in public; speaking out loud attributes value to what’s being said, value we don’t know until we speak it. This anecdote speaks to the fact that there is authority invested in the male voice. And anything outside that voice is required to prove itself before it even utters itself. But writing and speaking always contains so much more than just the authority or perceived frivolity of their speaker. ‘There are no neutral narratives,’ writes Hilton Als; everything is tainted by every accumulated experience and by self-interest. More darkly, Elena Ferrante writes that ‘there are no gestures, words, or sighs that do not contain the sum of all the crimes that human beings have committed and commit.’ Looking sideways, instead of upwards to find authority is a good place to start seeing authority for what it is. Looking inward at the crimes committed that permit or prohibit your own voice is another. And so perhaps representation precedes excellence. Or, that the excellence is an imagined commodity that’s traded between mediocre people to create barriers to entry; to protect their own authority. I took the commission; I agreed to put my voice in the small-scale, community-organised, feminist philosophy ring, on the condition that I could speak about something I think that I know about. But looking sideways, looking inward, what do I know? 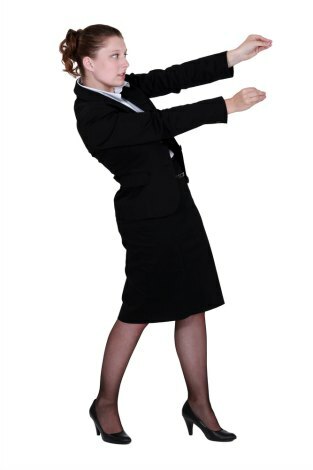 Corporate woman image by Shutterstock. Thank you for this thought provoking and engaging piece, from a writer who continually achieves excellence. Hopefully this gender-locked question of 'authority' is evolving, as there is increasingly a healthy representation of women at the forefront of education and media, to exemplify two sectors of public discourse and socialisation; women who are very credible voices speaking from a vantage point high above mediocrity. Recently rendered, horrendous politics aside (PA, or 'pre-Abbott'), you could see increasing signs of equity and capacity in the Canberra cabal of pollies and public servants. And one of the loudest and most credible voices (if indeed not the pre-eminent voice) in the realm of contemporary politics and human rights, I'd suggest, is Professor Gillian Triggs, who sets an example of competence, conscience and courage for women and men alike. I look forward to a halcyon day when authority is earned, not invested, regardless of gender. Brilliant article, Ellena. I share your enthusiasm for the mediocre. My favourite movie: Dial M for Mediocre. My favourite novel: "The Mediocre in the Rue Morgue" by E A Poe. My favourite poem: "Mediocrity" by devon da poet. Favourite Meal: Spaghetti and mediocrity. Yep, mediocrity's in my blood. This article is very heartening Ellena. Thank you. It is interesting- perhaps a sign of our growing maturity - that both of today's articles are concerned with our finite resources. The first with the material resources of Earth, and Ellena's with our intellectual abilities. In a very real sense no one knows everything, though some like to behave as if they do. The age-old story of the hare and the tortoise reminds us that steady application will often trump flashy dashes. We are all relatively mediocre, but can triumph eventually by dogged regular increments to our abilities and resources. I don't think that mediocre is the correct word. We are complimentary. Most men would come up as mediocre if judged by women's standards. It is to be expected that women unfairly deemed mediocre by men's standards. That doesn't mean they fall short by human standards. True intellectuals respect the gifts of every person. So much intelligence, so much insight, and she's a woman, even! Thank you, Ellena, for giving me so much to think about. Personally, any thinking I do is mediocre and is transmitted via Facebook - but I do like to peer up and see a star now and then! It was a terribly insightful article Ellena. In answer to your question: ..."what do I know?" I would suggest you know a great deal. I suspect you know much in the way intelligent women do: intuition is a very useful bulldust detector. You are well and truly out of the "mediocre" category. Despite the fact that most women (as well as most men) possess little public power and thus are credited with little "achievement" in the eyes of the world I think most are far from mediocre. Everyone has some worthwhile achievement in some aspect of their lives: work, family, leisure etc. High achievers often have their own insecurity. Feminism, to me, seems to have been a natural reaction and defence against a society which got the power equation wrong in just about every aspect. And what of the “compassion and courage” that Ross also ascribes to Trigg? A perusal of the slanted and politically motivated AHC Children in Detention report that was produced under her watch would suggest otherwise. The only redeeming feature about this sloppily produced and biased report was the Immigration Dept rebuttal of many of its claims that were published in the back (in small nondescript print). If Trigg was so compassionate why was this report not produced during the Labor Government’s term when there were over 2000 children in detention compared to the 200 or so when the report appeared? And Trigg’s “courage”? Well, when you’ve got the whole asylum-seeker lobby and PC community cheering you on it’s easy to be brave, especially when you are on $410,000 a year like Trigg is! Far more courageous was whistle-blower Allan Kessing who exposed the gaping holes in Sydney Airport security for which he received a nine-month suspended sentence for “whistleblowing”. Why hasn’t Trigg and her HR cronies gone out to bat for Kessing instead of some wife-killer? In 2012, the then Labor government refused to grant this heroic man a pardon – absolutely disgraceful! Yet there has been nothing but a deafening silence from Trigg and her HR cronies on this? I think that 'Dennis' is a tad confused 'ab ovo usque ad mala', specifically about the identity of the fellow commenter he is referring to and the nature of the issues he raises concerning Professor Trigg. Whatever legalistic justifications Trigg can give for the AHC ruling on the Basikbasik case the fact remains that its report on him displayed some egregious omissions. Its failure to note that his wife was four months pregnant when he bashed her to death and that he had a history of breaching bail conditions were the most notable. And while the report may have a valid point in that no proper management plan was devised for him in jail, the question is why. Was it because psychiatrists found that he had no insight into his crimes and thought that he would gain little from such a program? With limited psychiatric resources available perhaps they thought that these should be used to help other prisoners who had more prospects for rehabilitation. Legally though it could be said that Basikbasik should have been released after completing his sentence. But then prisoners can continue to be detained if they are deemed to be a serious threat to public safety, as has been done on occasion. Whatever the case, there are far more worthy individuals than wife-killers like Basikbasik that the AHC should be fighting for, including courageous whistle-blowers like Allan Kessing, who has been treated appallingly by Australian authorities. The AHC might also like to examine how the rights of exploitated and abused foreign workers in Australia have been violated - honest hard-working people who have committed no crimes. Her name is Professor Gillian Triggs, not Trigg. Gotcha Penelope. Triggs it is! Here's a story. A man who was a soldier in the American army in Iraq tells it to me. A friend of his, one of his best and closest friends, was nearly pierced through by a bullet fired by a sniper. American surgeons removed the bullet and discovered it was a 5.56mm cartridge manufactured in Lake City, Missouri. For profit. World-weary detectives Juan and Pedro arrive in an agrarian township on Spain's Guadalquivir Marshes to investigate the disappearance of two teenage sisters. But their investigation among the town's various innocents, eccentrics and reprobates uncovers a much larger, sinister burr within the very soul of the town. The smell of fascism lingers thickly in the air.